Good morning! It’s Katie from View From The Fridge back again, today! In honor of the first official day of Fall (yes, it’s here! 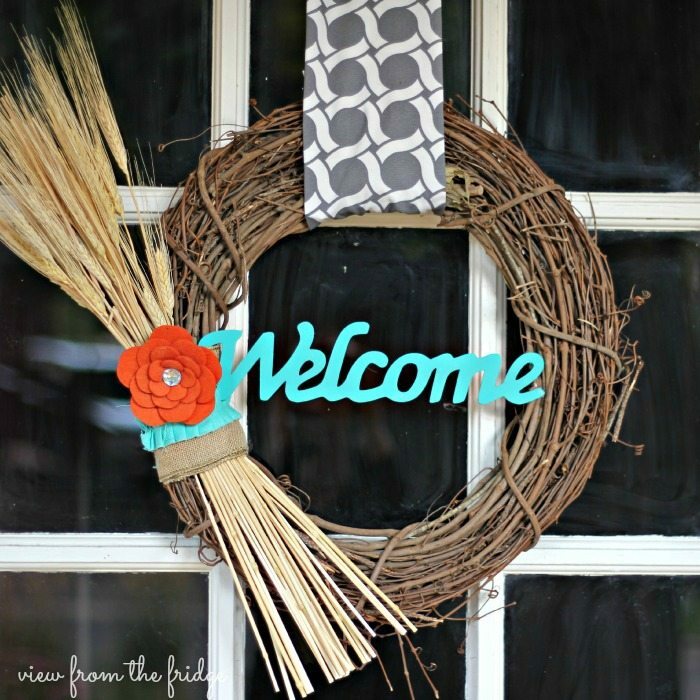 ), I thought I’d share a festive (and very quick) project with you … an EASY 5 Minute DIY Fall Wreath! With my Fall decor this year, I’m going for a neutral color scheme with some accents of orange and turquoise thrown in. 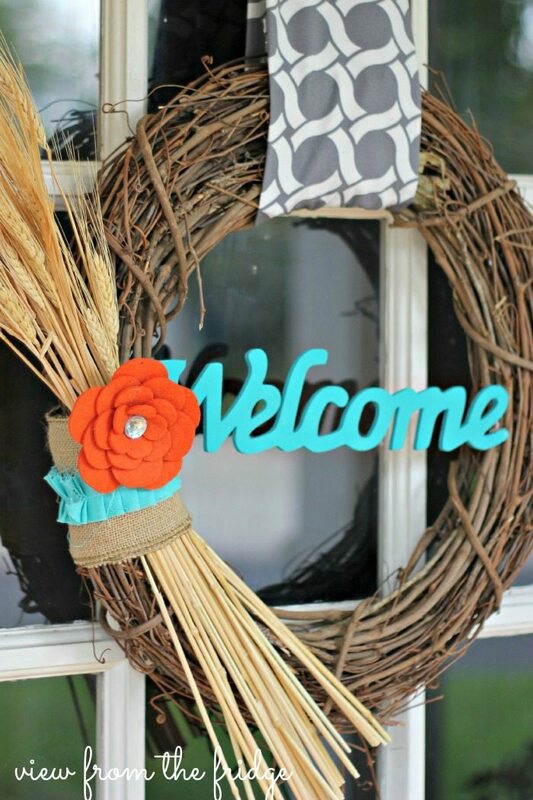 This wreath happens to fit right in, and the best part???? I was able to make it while all three of my boys were playing right next to me. It was so simple, I finished before anyone started crying, got in a fight, starting whining, or wanted a snack! Huge WIN!! Go Mom! Faux Wheat Stems. I also found these at Michael’s. One huge bunch for $4.99 (I used less than half for this wreath, and put these others in a vase on the mantel). 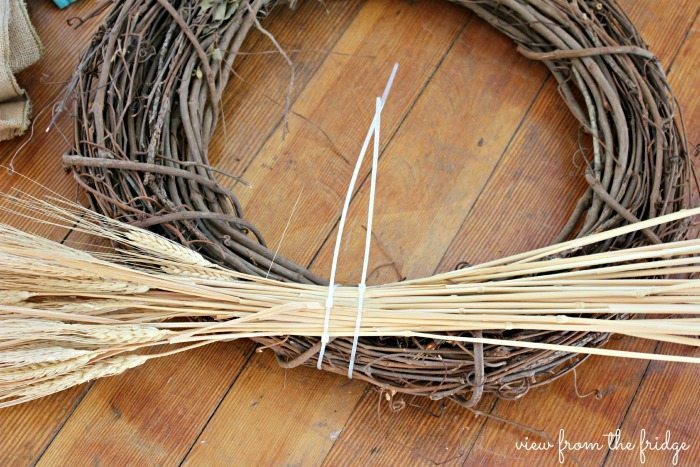 Zip ties or string, twine, ribbon … just something to secure the wheat stems to the wreath. Accent ‘ribbon’. I found this turquoise ruffled fabric ribbon at Michael’s (I sound like an advertisement for Michael’s here, don’t I ….). Clip on pre-made flower (again, from Michael’s). And here’s how easy the process is … 5 minutes, tops (I took me more time to figure out how to hang it correctly on our door!). 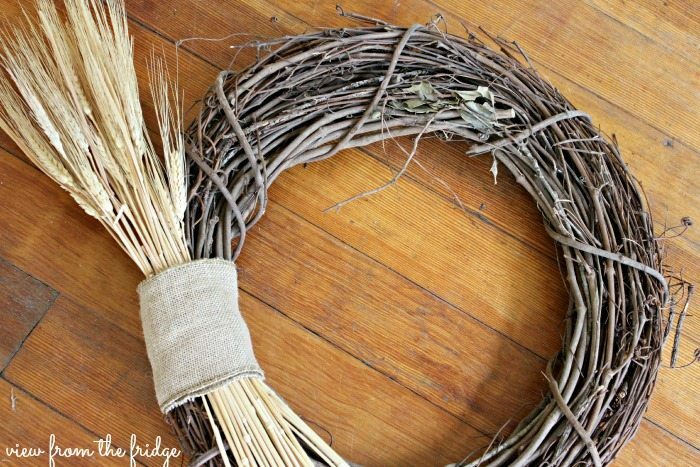 Next, wrap the burlap ribbon around the stems covering the zip ties or string. I wrapped it around twice and then glued the ends together in the back. 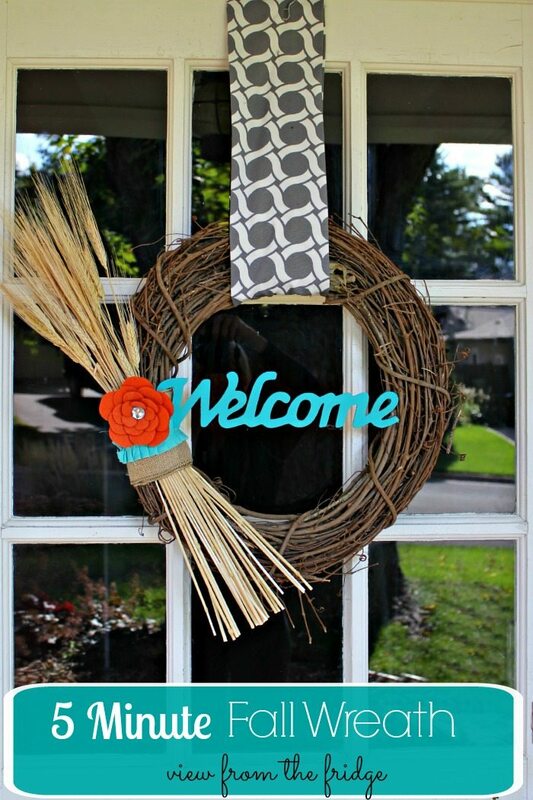 Tie your accent ribbon around the burlap and secure with hot glue in the back. 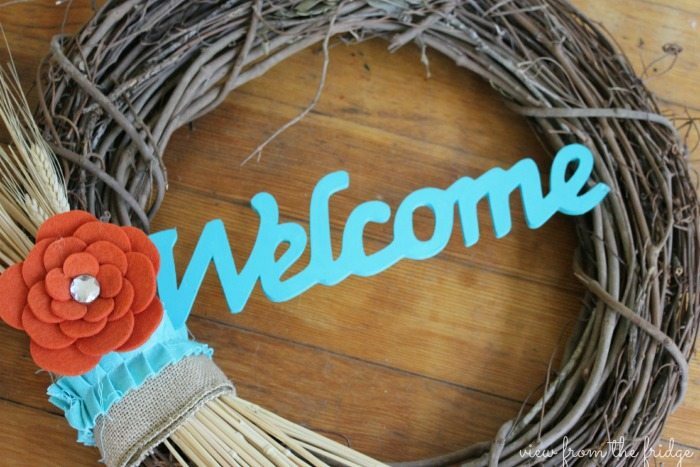 Hot Glue your WELCOME letters to either side of the wreath and clip on your flower! The final step is to hang and admire!! 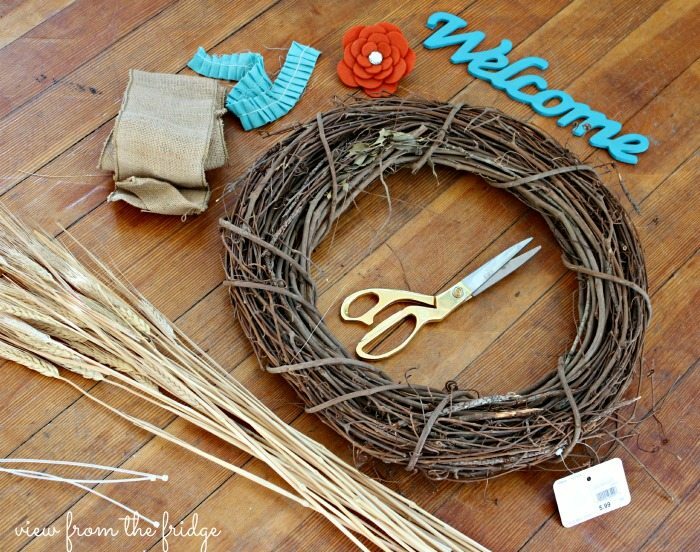 (I used some extra fabric I had laying around for the wreath ‘hanger’, but you could also use ribbon, twine, more burlap, yarn … or nothing and just hang it straight on a nail!). That’s it! 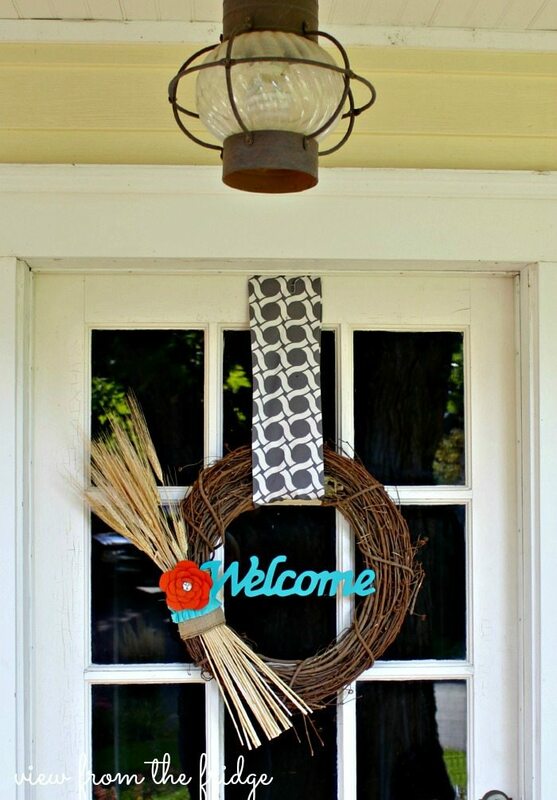 I promise it really is a quick project that has your door looking mighty festive for the first day of Fall! Thanks, Heather!! I am loving turquoise and orange together! Hope you had a good weekend! So pretty! I love the colors you chose to accent! Pinning. Five minutes–I could do that! 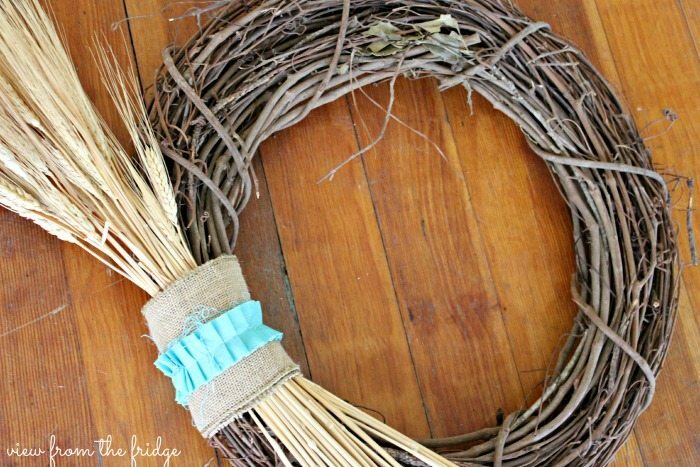 Gorgeous wreath. Seems simple enough for me to try to make it. Looks like its from the store, can’t believe it’s so easy to make!! 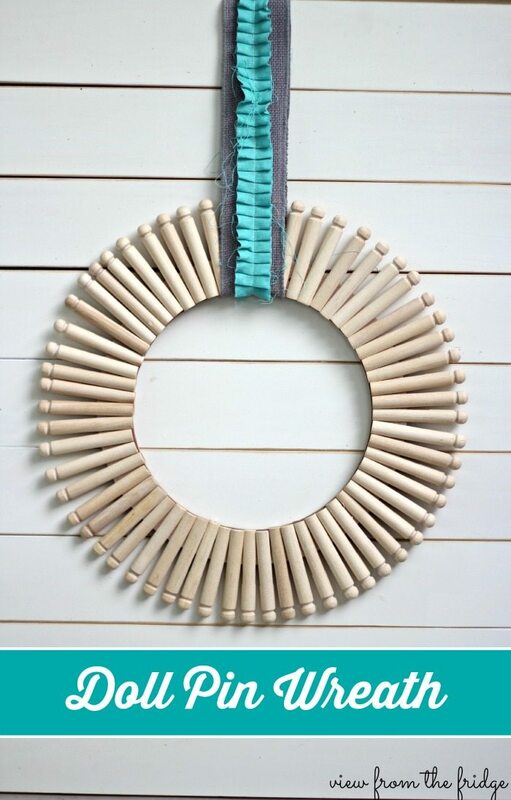 This looks easy and not messy like the live wreaths.